3rd Battalion made contact with another enemy company-sized unit after it passed through 6th Battalion’s spot. It was fortunate for this Battalion that otherwise would risk being “held down by the head while being kick on the rear”. - Đánh diện diệt điểm = Exert pressure against a secondary point and destroy the main point. - Nhất điểm lưỡng diện = one main attack and two diversionary attacks. - Kiềm thủ kích vĩ = hold down the head and kick the rear. These Eastern military tactic expressions were only used in the Vietnamese narrative of Pleime, Trận Chiến Lịch Sử, not in the English narrative of Why Pleime. For the sake of American readers, Colonel Hieu uses American doctrinal military terms. The Dien Bien Phu Battle which ended the Indochina war (1947-1954) lasted for two months but was merely an encirclement of a stronghold in the Dien Bien Phu Bowl. is no doubt the biggest battle from the last years. 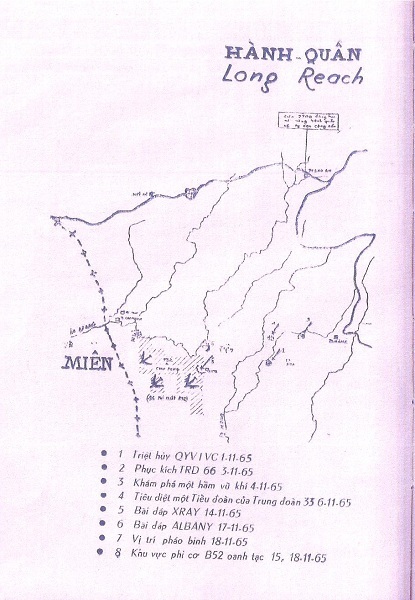 In the Plâyme campaign, the VC has coined the famous tactical expression, "Nắm giây lưng quần địch mà đánh" (General Nguyễn Chí Thanh), “When attack, grab the enemy by the belts” or “grab their belts to fight them” that the Americans translate as “close embrace” or “bear hug”. In the Pleiku campaign, the Americans have coined the famous tactical expression “air assaults” (General Kinnard) that the VC translates as “nhảy cóc” “frog leaps” or "eagle plunges". In the Pleime campaign, the ARVN has coined a not so well-known tactical expression, due to the fact that an American conspiracy had tried to render it oblivious by replacing it with Pleiku to sound more American and erase all ARVN vestiges. That tactical expression is "Trường Chinh", "Long Reach" that the Americans would have translated as "Hail Mary Pass" tactic borrowed from football’s terminology - that is if they grasped the operational concept of the Pleime Offensive into Chupong-Iadrang of using B-52 strike conceived by Colonel Hieu. Colonel Hieu illustrates the implementation and execution of this operational concept in a map posted in Pleime, Trận Chiến Lịch Sử, showing the curve of the football trajectory when the 8 dots are connected! - hold tail with Air Cav assaults, strike head with Arclite bombings. The VC countered the US Air Cav’s “frog leap” tactic with “grab the enemy by the belts” tactic. Colonel Hieu neutralized it with “hold tail with Air Cav assaults, strike head with Arclite bombings” tactic in which the VC troops are kept at a 3 km pole length. Knowles used the expression “grab the tiger by its tail” to reveal that the purpose for the insertion of the Air Cavalry troops was to “grab the tiger by its tail” and to hit its head with B-52 airstrikes from November 15 to 16. He also explains the reason for pulling out of LZ X-Ray on November 17 and moving to LZ Albany was “to grab the tiger by its tail from another direction” and continued to hit its head with B-52 bombs from November 17 to 20. What did the VC mean by “grab the enemy by the belts” tactic? General Nguyen Nam Khanh gives some precision. I pondered deeply in order to visualize the proper tactics that would "demoralize" the enemy. After 2 days, the 304th Division Commander and I presented in person to comrade Chu Huy Man the content of the "demoralizing strike". One was to annihilate an American airmobile cavalry battalion; two was to attack at close range and with bayonets (in close combat). In the preparation process, we encountered numerous difficulties, among which was an incident that stuck forever in my mind. It was that a section of cadres and combatants assessed mistakenly that American troops could not be attacked with close range combat using bayonets, and discarded almost all bayonets along Route 559 (from Route 9 to B3). I had to mobilize some political cadres together with the transportation unit to go back and gather bayonets from Route 9 to B3, succeeding in recuperating 300 pieces, sufficient to arm 3 infantry companies (one of 7th battalion and 2 of 8th battalion of 66th Regiment). The use of bayonets in this battle was not to be entrusted to just anybody, but to selected and highly motivated and determined combatants to defeat the American troops. Then to motivate, to train to the perfection the bayonet combat tactic, close range combat and light foot, under enemy fire, in order to ascertain close contact appropriate to the targeted Americans that we will face at Ia Drang valley. The green troops expended a lot of ammunition early on, firing mostly at shadows. During the early days at An Khe, the saga of Maggie the mule ended tragically. She wandered too far outside the perimeter one cloudy night and was shot by a spooked picket guard. The flailing about on the perimeter revealed a fundamental truth about the division for someone who was perceptive enough to see it: the 1st Cavalry Division (Airmobile) that had just arrived in Vietnam was not an elite unit. True, the concept of airmobility was elite, but the troopers who were to provide the sinew for making the concept a reality were typical of the American infantry, artillery, and engineer soldiers the U.S. Army was providing to all of its line outfits in 1965. The eagles were mighty when up in the air with air and artillery supports. But once on the ground, as infantrymen, they were no match to the NVA troops - that were motivated, trained to the perfection in the bayonet combat tactic and close range combat and light foot, that grabbed them by the belts. General Kinnard really underestimated the enemy in thinking that he would wrap up his troops and bring them back home after a couple of weeks operating in the Highlands. Cochran: Only a few weeks after your division arrived, you would begin sending troops home? Kinnard: Yes, but you must remember that at that time it was a possibility that we might have to fight our way ashore if Vietnam was, in fact, cut in half. Also, if I had said that a man had to have a year to go, it would have destroyed the division - down to 45 percent strength. It was very important that we had a well-trained team to win the first battles. Still, it did make for an awkward situation with people beginning to go home as soon as we got there. And right after the LZ X-Ray battle he wanted to have his 2nd Brigade pursue the enemy into Ia Drang Valley. It was fortunate that Colonel Hieu sent in the Airborne Brigade instead. 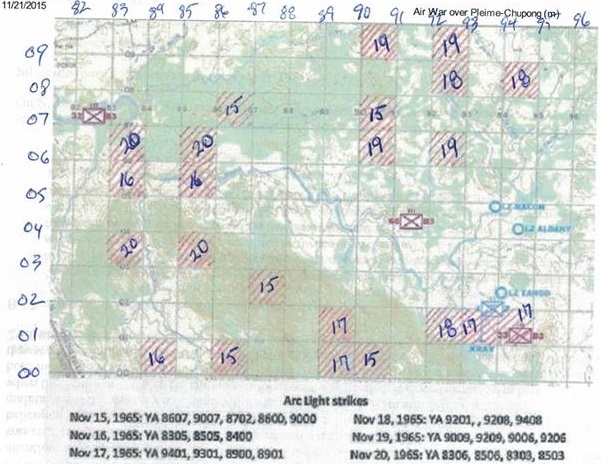 Otherwise the 1/5 Air Cav Battalion and 2/5 Air Cav Battalion troops would be grabbed by the belts by the NVA 635th and 334th Battalion troops. In terms of tactics, the Eastern military thinking seems to be more prolific, more thriving, more blossoming, more picturesque (crouching tiger, drunken monkey, hidden dragon, etc.) than the Western one’s. To the latter, besides the terms mentioned by Colonel Hieu in Why Pleime, I can only think of one more, “anvil and hammer” tactic. The expressions in Eastern military tactical terminology are the same as the ones used in the Chinese martial arts and in particular in the Chinese chess, the pieces of which comprise: tướng (general), sĩ (general staff officer), tượng (elephant - heavy weaponry unit), xe (armor), pháo (artillery), mã (cavalry), tốt (infantry); and the chessboard is the battlefield. This explains a good military strategist/tactician officer can easily be a master in Chinese chess. 24. Americans working with him in MR-3 find him friendly and cooperative. In Bien Hoa, he lives in a trailer at MR-3 Hq and spends most nights there only occasionally taking an overnight leave to be with his family in Saigon. He frequently visits in the home of Bien Hoa Consulate General senior officers for long evenings of discussion or chess games (he is a master of Chinese Chess, and plays “Western” chess well). He played shortstop on his high school softball team in Shanghai, but apart from pistol and rifle target shooting does not seem to play any sport now. He often borrows books on world affairs from his American friends. He has made a detailed study of Red Army defeat of German invasion forces in Russia in World War II and obviously admires the Russian performance. While candid, courteous, and friendly with American officials in MR-3, a certain reserve and circumspection, perhaps a part of a Mandarin sense of dignity and position is always discernible.